ntroducing Emerson Resort and Spa, an extraordinary destination offering the reassuring sense that one is no longer part of the outside world. Make yourself at home in one of our 53 exceptional guestrooms and suites. Enjoy comfort food favorites at theCatamount Restaurant. Or indulge in one of the soothing treatments at our Forbes Four-Star Spa. Outside, the picturesque Hudson Valley will complete this perfect environment of total harmony. In 1836 Ralph Waldo Emerson wrote “Nature,” an essay inspired by the serene beauty of this area. The publication of “Nature” prompted the American Conservation Movement, which led to the establishment of the 600 square-mile Catskill Forest Preserve that surrounds Emerson Resort and Spa. Where the resort now stands was once The Riseley Flat, a thriving dairy farm built in 1840, and a barn built in 1860, which is now The Country Store. In 1874 trains began stopping at this site daily, bringing hordes of visitors for their first taste of the Hudson Valley. For many, that first taste was of the ice cream, made fresh at the Riseley dairy. Though the cows have since moved on, the historic buildings have been lovingly restored for modern use. One of the most remarkable adaptations is the 64-foot high barn silo that was turned into the World’s Largest Kaleidoscope. Sadly, the Cockburn House, which was the location for the former Inn, was destroyed in a fire in 2005. However, with more than 40,000 square feet of new construction, including 26 guest suites, a new spa facility and expanded meeting/conference space, the Emerson Resort & Spa today has emerged more impressive than ever. William's Lake Resort to Get New Life? HIGH FALLS – Over a breakfast of fresh fruit salad and Eggs Benedict, Timothy Allred, project manager of Hudson River Valley Resorts, presented his group's development proposal for the former Williams Lake Resort to members of the Rondout Valley Business Association. First a little history: Anita Peck, whose grandfather founded the resort, said the family, after 75 years in business, had decided to shutter its doors and sell the property. She said the resort needed major renovations that were too cost-prohibitive for the family to invest in such a large project. The family had hoped the property would attract buyers who shared their land stewardship values and would work to preserve the area's unique history. In 1999, Peck placed 450 of the property's 730 total acreage into a land conservancy and donated 10 acres of natural cave to the nature conservancy when Indiana bats, an endangered species, were discovered to be hibernating and reproducing in the caves. Prospective buyers "came and went" when they realized more than half of the land was placed in a nature conservancy, until Peck said she overheard a member of an interested group say, "It's already got a land conservancy; we won't have to do it ourselves." Allred was one of the people visiting the resort that day in 2006, and, after purchasing the property, has located into the home in which Peck was raised. 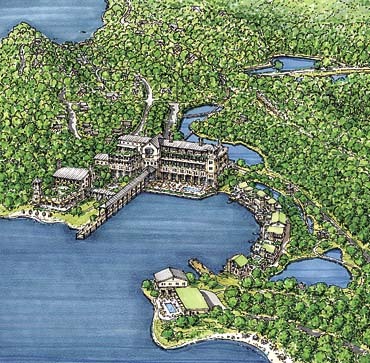 Hudson River Valley Resorts, the company proposing the $200 million project, consists of "four or five socially responsible investors," Allred said; "a handful of like-minded folks who are committed to this vision." He said that, with "the exception of anything of historic value," including the kiln walls, artifacts from Rosendale's vanished natural cement industry, and a building known as the honeymoon cottage, the project calls for the total demolition of the existing building, to be replaced by a "modern, clean, energy-efficient" resort. He described the property as rich in biodiversity, consisting of flora and fauna variety beyond just the "cute little bats." The developers' concept plan calls for sustainability in the redevelopment of the site into "a modern, higher-end resort and residential community," that focuses on wellness and outdoor recreation, complete with a spa and a health center. He said the idea is to have a spa, new resort, wellness center, and a museum highlighting Rosendale's natural cement history, with amenities such as hiking and biking trails along the entire conservation area. Plans also include "two neighborhoods" of 60 single-family homes and 100 kiln-styled townhouses, with walls that abut one of the prominent kiln walls on the site, creating "a verticality and a dramatic sense of the old and the new." The single-family homes will leave a "relatively small footprint," he said, "and are carefully sited for views and privacy, to minimize tree-harvesting, and are very thoughtfully placed for passive solar heating." The 130-room hotel is planned to be LEED certified, a program that rates a project's performance across a variety of spectrums, including "energy savings, water efficiency, CO2 reduction, indoor environmental quality, stewardship of resources and sensitivity to their impacts." Allred said he hopes the hotel will be built to Gold LEED standards; the highest level of LEED certification is Platinum. The overall project, he said, "fits so well with the plans of the county" in terms of the strategic planning because it emphasizes green building design, tourism and smart growth. Plans also include provisions for aggressive rainwater recycling and reuse, with an eye toward sustainability. He said the resort seeks to utilize local goods whenever possible in terms of supporting local farmer's markets, growers, and businesses, and is committed to working with local materials and suppliers. He said the project should create jobs to employ approximately 200 local people. Allred lamented the snail's pace of movement on the project, noting that they are still awaiting the final scope, which is one of the first steps involved in the SEQRA process. "We submitted our plans in November 2007 — the statute on the scope is supposed to be 60 days, we're now into our sixteenth month. Why does it have to take six, 10, 12 years before we can get through an environmental review process?" Acknowledging some local opposition to the project, he charged as "unfair" the criticism leveled at the project regarding the perceived loss of public access to the property. He said that, though the William's family has been very generous over the years, the property has always been private. Nevertheless, he said his organization is committed to continuing "Anita's legacy of providing access, particularly for recreation, environmental and educational purposes." To that end, he announced the return of the William's Lake Mountain Bike Classic, to be held on June 14, which is being co-sponsored this year by Favata's Table Rock Tours and Bicycles of Rosendale and Hudson River Valley Resorts, LLC. For more information about the Classic, visit: http://www.trtbicycles.com/. REGIONAL The Emerson Resort in the Catskills is part of the growing destination-spa scene in the Northeast. IN the world of spa travel, the Northeast is not known for leading the way. With a few exceptions, the best-known, most sought-after destination spas tend to be far west of the Mississippi and well south of New Jersey; California, Arizona, Utah and Florida are some of the hot-spot states. But as more travelers seem to expect spa treatments to be part of their getaway experiences, and spas within driving distance of New York City recognize that travelers in a squeezed economy want to stay closer to home, a growing number of nearby hotels and resorts are building spas, revamping existing ones and rolling out all-out marketing blitzes to draw more travelers to the luxurious land of the facial, the massage and the manicure. The Northeast spas all have two key shifts in the spa industry going for them. First, the great spa experience is no longer necessarily built around warm weather; the opening of the all inclusive, fitness-and-weight-loss-focused Canyon Ranch in Lenox, Mass., in 1989, signaled the renaissance of the winter-weather spa. And second, while 10 years ago spa vacations tended to last a week or more, with many resorts requiring seven-day stays, more spas, lodges and hotels that have added spas now allow quick stays. So a two-day jaunt to a spa is much more common at a time when Americans are taking shorter vacations. Wearing a bathrobe while eating grapes and sipping detoxifying teas, getting a deep-tissue massage and then taking a steam bath, all within the first few hours of your vacation, is a pretty efficient way to unwind. According to SpaFinder, there are more than 1,500 day and destination spas within a 200-mile driving distance of New York. Of them, 31 are listed as overnight or resort spas, though Canyon Ranch and the Deerfield Spa, a much less expensive all-inclusive fitness spa in the Poconos in Pennsylvania, are among the few that qualify as true destination spas, meaning that everyone has traveled there for a spa experience. OPENED in 2006, the Lodge at Woodloch, also in the Poconos but more upscale than Deerfield, bills itself as a destination spa. The Mohonk Mountain House, a Victorian-era lodge in New Paltz, N.Y., added a 16-treatment-room spa in 2006. The number of overnight spas within a four-hour drive of New York City has increased slightly in recent years, although the total number of such spas across the country has increased faster, according to SpaFinder. Still, spa mavens have taken note of a few additions and changes on the local landscape — a green spa and a more traditional lodge that was rebuilt after a fire, both in the Catskills, as well as a funky and lavish resort in northwest Connecticut. An organic vegetable garden, llamas, chickens, honey bees, goats and peacocks are not typical at spas, but nor is using solar-power and geothermal energy to heat the sauna, steam room and mineral salt water pool. At Buttermilk Falls Inn and Spa in Milton, N.Y., about 90 minutes north of Manhattan, manicures and pedicures are done beside the indoor pool, which is enclosed by soaring glass ceilings and overlooks the Hudson River. A 10-room inn built in 1680, where prices range from $225 to $425 a night (separate and much more spacious carriage houses range from $325 to $650 a night), Buttermilk opened nine years ago and had a small, cramped spa in one of the cottages with tiny treatment rooms separated by screens. But last year the owner, Robert Pollock, who also owns the Great Jones Spa in Manhattan, built the new solar-powered spa. The spa, which is open to people who are not guests at the inn, is spare and sleek and has seven treatment rooms and a small steam and sauna room. Mr. Pollock said he was planning to bring yoga and a gym to Buttermilk, and possibly dinner and cooking classes. A 60-minute deep-tissue massage or a basic facial costs $100. For those looking for a fitness vacation, Buttermilk would not deliver, though there are some running trails on the property and plenty of biking, kayaking and other outdoor recreation in the Hudson Valley. Included in the cost of lodging is breakfast, made with eggs from the chicken coop and fruits and vegetables from the organic garden, and afternoon tea, but the inn does not serve dinner. There are several restaurants in New Paltz and on the Newburgh waterfront, about a 20-minute drive, and the four restaurants of the Culinary Institute of America in Hyde Park, about 25 minutes away, which are closed the first three weeks of July and between Christmas and New Year’s. , about two hours from Manhattan. It completed a major renovation last year after a blaze damaged much of the main inn in 2005. With the reopening, the resort, along Route 28 in Mount Tremper, where there is no cellphone service, opened an 8,000-square-foot spa. The smaller original spa is still standing across the street and is used for overflow on the weekends. The 25 suites in the main inn — rates range from $520 to $705, including breakfast — are handsomely appointed, many of them duplexes with small balconies. But the adjoining and more affordable log-cabin-style lodge, with another 27 rooms, where current rates range from $248 to $486, also including breakfast, feels something like a downtrodden, overpriced motel. The spa itself, which is opened to nonguests, does not feel much like an escape, and has an awkward setup: the facilities — the 10 treatment rooms, the nail and hair salon and a small fitness center — are spread out along the public corridor of the hotel’s main building. At least one fitness class is offered on Sundays and weekdays, and on Saturdays there are cardio, Pilates, yoga and tai chi classes. Guests interviewed over a recent weekend said the treatments were uneven. Although the same guests said they were disappointed with the food at the hotel restaurant, the Phoenix, they said the food at the spa cafe was excellent, offering fresh smoothies and salads with locally grown vegetables. The spa offers unusual treatments, including a cranberry bog bath and a hot-oil-and-herb-poultice massage, in which the therapist uses heated herb packs dipped in oil to scrub and detoxify the skin, followed by deep-tissue massage. The 50-minute treatment is $105. A traditional 50-minute Swedish massage is $95, and a 50-minute facial is $95. ALSO about two hours from Manhattan, in the Litchfield Hills of northwest Connecticut, is the far more decadent and expensive Winvian. If one does not flinch at spending, on average, $2,000 a night, including exceptional meals and ample liquor in your room but not including spa treatments, then read on. This adult playground (many reviews have used the words “gimmick” and “whimsy”) is the kind of place where you never have to leave your room to feel like you have gone to a very wild, crazy yet relaxing place that has thought of every detail before it could ever occur to you. Is there a television? Wait, there it is now, rising mechanically out of the floor. The lodging there, inside a grand farmhouse and in 18 cottages designed by 15 different architects, is the highlight, the spa almost incidental. The cottages, on 113 acres, are from 950 square feet to 1,250 square feet, each with a distinct theme — the Helicopter Cottage contains a fully restored 17,000 pound Sea King Pelican chopper, and inside the copter is the bar and entertainment center; the Greenhouse Cottage is made almost completely of glass; and the Maritime Cottage is essentially a luxurious lighthouse. Each room (accommodations are for two but rooms have pull-out couches and the resort allows children only at certain times of the year) has a generous private steam room, which is nice because the spa has a tiny steam room and sauna. Prices range from $1,450 to $1,950. Current rates at the Mayflower, about eight miles away, with its more elaborate spa and extensive menu of fitness classes, are $520 to $1,500. At Winvian bicycles are left outside your door, and the resort sits next to the 4,000-acre White memorial foundation, where you can hike, bike, ride a horse, snowshoe and cross-country sky. There are also canoeing and boating nearby. The resort has yoga classes on weekends only, but there is a small gym next to the spa with a treadmill, elliptical trainer, exercise bike, yoga mats, free weights and medicine balls. Each weekend there is one free yoga class. The 5,000-square-foot facility has large glass rooms and vaulted ceilings and evokes the feeling of an old New England farm, except that the aromas inside go more toward cucumber and lavender than manure. Like Buttermilk Falls, it uses an all-natural skin care line, in its case, Ren, a very expensive British brand in addition to Eve Lom, which is not all natural. A 75-minute Ren facial is $265; a 60 minute Swedish massage is $150. The spa restricted to guests of the hotel. She said 80 percent of the guests, most from New York City, are using the spa. Mayflower Inn & Spa 118 Woodbury Road, Washington, Conn.; (860) 868-9466; www.mayflowerinn.com. Winvian 155 Alain White Road, Morris, Conn.; (860) 567-9600; www. Winvian.com. Canyon Ranch 165 Kemble Street, Lenox, Mass. ; (413) 637-4100; www.canyonranch .com. Deerfield Spa 650 Resica Road, East Stroudsburg, Pa.; (800) 852-4494; www.deerfieldspa.com. Lodge at Woodloch 109 River Birch Lane, Hawley, Pa.; (866) 953-8500 www.thelodgeatwoodloch.com. Mohonk Mountain House 1000 Mountain Rest Road, New Paltz, N.Y.; (845) 255-1000; www .mohonk .com. Buttermilk Falls Inn and Spa 220 North Road, Milton, N.Y.; (845) 795-1310; www.buttermilkfallsinn.com.